Whether you like fish or not, everyone can agree that when you cook it, it has a rather strong odor. If you don’t like fish, this is a strong and unpleasant odor and even if you do like it, you probably don’t like the smell of it three days after you’ve cooked and it’s still hanging out in your living space. 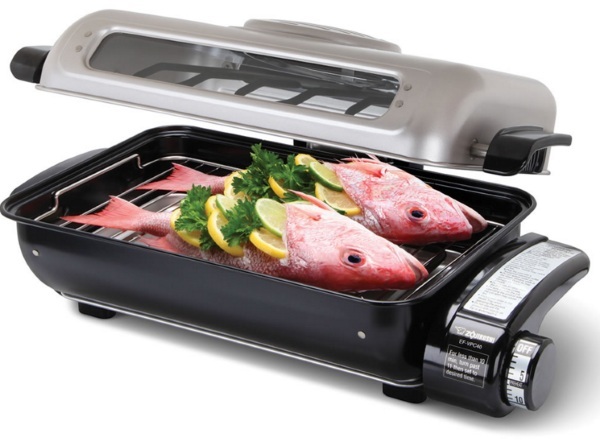 The Odor Eliminating Fish Roaster will let you cook yummy fish with none of the yucky smell. This is countertop device that can accommodate a wide variety of fish. Probably not the monster you caught on vacation that one time but most of what you can pick up from the market will slide right in. It has both lower and upper heating elements so that the fish cooks evenly on both sides. The odor cutting magic is in the lid. There is a catalytic filter on it that takes out 90% of the byproducts that create the fish smell and smoke leaving you with a fish smell free kitchen and a plate of well cooked fish. You can pick up the Odor Eliminating Fish Roaster for $169.95.